Israel has the right to defend itself against a country that wants to destroy it, Israeli Prime Minister Benjamin Netanyahu said today as he began a meeting with Prime Minister Stephen Harper that is expected to focus heavily on Iran. “I know from many conversations that we’ve had that you share my view that this is a grave threat to the peace and security of the world and I think it is important that the international community not allow this threat to materialize,” Netanyahu said to Harper as they held a photo opportunity in Harper’s office. “As for Israel, like any sovereign country, we reserve the right to defend ourselves against a country that calls and works for our destruction. Prime Minister Benjamin Netanyahu said Israel has the right to defend itself against Iran, which he said calls and works for Israel’s destruction. He also stated that Iran should dismantle its underground enrichment facilities. Netanyahu made the remarks Friday in a photo opportunity before meeting with Canadian Prime Minister Stephen Harper in Ottawa. The prime minister dismissed the idea of renewed international negotiations with Iran aimed at preventing the country from building a nuclear weapon. “It could do again what it has done before, it could pursue or exploit the talks as they’ve done in the past to deceive and delay so that they can continue to advance their nuclear program and get to the nuclear finish line by running up the clock, so to speak,” Netanyahu said after concluding his meeting with Harper. “I think the international community should not fall into this trap,” he said. Israeli Prime Minister Benjamin Netanyahu arrived in Canada on Friday ahead of White House talks next week expected to focus on halting Iran’s controversial nuclear drive. Shortly after his arrival, Netanyahu met privately with Canadian Prime Minister Stephen Harper, a keen backer of Israel. He was to travel on to Washington on Sunday. 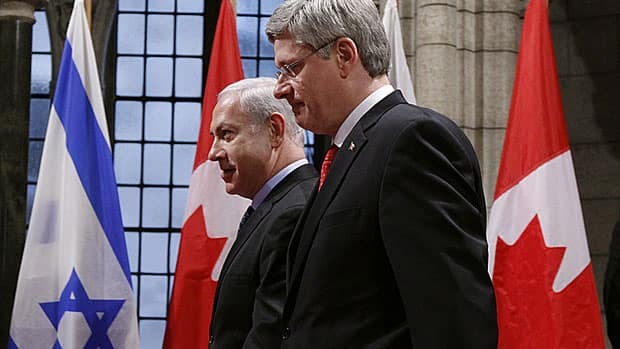 “Among the things I’d like to discuss with you is the remarkable turbulence that is shaking the Middle East, and of course, Iran’s relentless pursuit of a nuclear weapons,” Netanyahu said to Harper as the two leaders sat down for talks in Harper’s parliamentary office. “I know from many conversations we have had that you share my view that this is a grave threat to the peace and security of the world, and I think it is important that the international community not allow this threat to materialize. Israeli Prime Minister Benjamin Netanyahu’s popularity has risen dramatically following his Washington trip, according to a poll. Some 47 percent of Israelis polled believe Netanyahu’s trip to the United States was a success and some 10 percent viewed it as a failure, the new Haaretz poll found. The poll found that 51 percent of those questioned were satisfied with Netanyahu’s performance, while 36 percent were not — nearly the opposite of a previous poll taken more than a month ago in which 38 percent of Israelis expressed satisfaction with Netanyahu’s performance and 53 percent disappointment. Nearly half of the public felt “pride” at seeing Netanyahu address the U.S. Congress, while only 5 percent called it a “missed opportunity.” The rest expressed no opinion, while 20 percent of those questioned said they hadn’t watched the speech. Some 43 percent of the respondents called Obama “businesslike,” 25 percent called him “friendly” and 20 percent hostile. The poll was conducted by the Dialog organization under the supervision of Professor Camil Fuchs of the Tel Aviv University Statistics Department.